By increasing population of the world, towns are expanding, many buildings construct near high voltage overhead power transmission lines. The increase of power demand has increased the need for transmitting huge amount of power over long distances. Large transmission lines configurations with high voltage and current levels generate large values of electric and magnetic fields stresses which affect the human being and the nearby objects located at ground surfaces. This needs to be investigating the effects of electromagnetic fields near the transmission lines on human health. The electricity system produces extremely low frequency electromagnetic field which comes under Non ionizing radiations which can cause health effects. Apart from human effect, the electrostatic coupling & electromagnetic interference of high voltage transmission lines have impact on plants and telecommunication equipments mainly operating in frequency range below UHF. IS Power Line EMF safe? This is the controversy Discussion directly eludes on Government Regulation policy and Power Company. There are lots of supporting documents and research paper in favor and criticize this arguments. Electric and magnetic fields, often referred to as electromagnetic fields or EMF, occur naturally and as a result of the Power generation, Power Transmission, Power distribution and use of electric power. EMF is fields of force and is created by electric voltage and current. They occur around electrical devices or whenever power lines are energized. Electric fields are due to voltage so they are present in electrical appliances and cords whenever the electric cord to an appliance is plugged into an outlet (even if the appliance is turned off). Electric fields (E) exist whenever a (+) or (-) electrical charge is present. They exert forces on other charges within the field. Any electrical wire that is charged will produce an electric field (i.e. Electric field produces charging of bodies, discharge currents, biological effects and sparks). This field exists even when there is no current flowing. The higher the voltage, the stronger is electric field at any given distance from the wire. The strength of the electric field is typically measured in volts per meter (V/m) or in kilovolts per meter (kV/m). Electric fields are weakened by objects like trees, buildings, and vehicles. Burying power lines can eliminate human exposure to electric fields from this source. Magnetic fields result from the motion of the electric charge or current, such as when there is current flowing through a power line or when an appliance is plugged in and turned on. Appliances which are plugged in but not turned on do not produce magnetic fields. Magnetic field lines run in circles around the conductor (i.e. produces magnetic induction on objects and induced currents inside human and animal (or any other conducting) bodies causing possible health effects and a multitude of interference problems). The higher the current, the greater the strength of the magnetic field. Magnetic fields are typically measured in tesla (T) or more commonly, in gauss (G) and milli gauss (mG). One tesla equals 10,000 gauss and one gauss equals 1,000 milli gauss. The strength of an EMF decreases significantly with increasing distance from the source. The Strength of an electric field is proportional to the voltage of the source. Thus, the electric fields beneath high voltage transmission lines far exceed those below the lower voltage distribution lines. The magnetic field strength, by contrast, is proportional to the current in the lines, so that a low voltage distribution line with a high current load may produce a magnetic field that is as high as those produced by some high voltage transmission lines. In fact, electric distribution systems account for a far higher proportion of the population’s exposure to magnetic fields than the larger and more visible high voltage transmission lines. 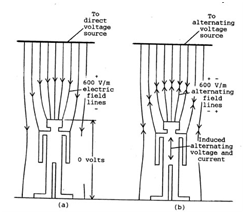 Electrical field: the part of the EMF that can easily be shielded. Magnetic field: part of the EMF that can penetrate stone, steel and human flesh. In fact, when it comes to magnetic fields, human flesh and bone has the same penetrability as air! Both fields are invisible and perfectly silent: People who live in an area with electric power, some level of artificial EMF is surrounding them. The magnetic field strength produced from a transmission line is proportional to: load current, phase to phase spacing, and the inverse square of the distance from the line. Many previous works studied the effect of different parameters on the produced magnetic field such as: the distance from the line, the conductor height, line shielding and transmission line configuration and compaction. Extremely high voltages in EHV lines cause electrostatic effects, where as short circuit currents & line loading currents are responsible for electromagnetic effects. The effect of these electrostatic fields is seen prominent with living things like humans, plants, animals along with vehicles, fences & buried pipes under & close to these lines. The human body is a composed of some biological materials like blood, bone, brain, lungs, muscle, skin etc. The permeability of human body is equals to permeability of air but within a human body has different electromagnetic values at a certain frequency for different material. The human body contains free electric charges (largely in ion-rich fluids such as blood and lymph) that move in response to forces exerted by charges on and currents flowing in nearby power lines. The processes that produce these body currents are called electric and magnetic induction. In electric induction, charges on a power line attract or repel free charges within the body. Since body fluids are good conductors of electricity, charges in the body move to its surface under the influence of this electric force. For example, a positively charged overhead transmission line induces negative charges to flow to the surfaces on the upper part of the body. Since the charge on power lines alternates from positive to negative many times each second, the charges induced on the body surface alternate also. Negative charges induced on the upper part of the body one instant flow into the lower part of the body the next instant. Thus, power-frequency electric fields induce currents in the body (Eddy Current) as well as charges on its surface. The currents induced in the body by magnetic fields are greatest near the periphery of the body and smallest at the center of the body. It is believed that, the magnetic field might induce a voltage in the tissue of human body which causes a current to flow through it due to its conductivity of around them. The magnetic field has influence on tissues in the human body. These influences may be beneficial or harmful depending upon its nature. The magnitude of surface charge and internal body currents that are induced by any given source of power-frequency fields depends on many factors. These include the magnitude of the charges and currents in the source, the distance of the body from the source, the presence of other objects that might shield or concentrate the field, and body posture, shape, and orientation. For this reason the surface charges and currents which a given field induces are very different for different Human and animals. When a person who is isolated from ground by some insulating material comes in close proximity to an overhead transmission line, an electrostatic field is set in the body of human being, having a resistance of about 2000 ohms. When the same person touches a grounded object, it will discharge through his body causing a large amount of discharge current to flow through the body. Discharge currents from 50-60 Hz electromagnetic fields are weaker than natural currents in the body, such as those from the electrical activity of the brain and heart. For human beings the limit for undisturbed field is 15 kV/m, R.M.S., to experience possible shock. When designing a transmission lines this limit is not crossed, in addition to this proper care has been taken in order to keep minimum clearance between transmission lines. Following serious health Problems may be arise due to EMF effects on human Body. (1) Risk of damaging DNA. Our body acts like an energy wave broadcaster and receiver, incorporating and responding to EMFs. In fact, scientific research has demonstrated that every cell in your body may have its own EMF, helping to regulate important functions and keep you healthy. Strong, artificial EMFs like those from power lines can scramble and interfere with your body’s natural EMF, harming everything from your sleep cycles and stress levels to your immune response and DNA! After hundreds of international studies, the evidence linking EMFs to cancers and other health problems is loud and clear. High Voltage power lines are the most obvious and dangerous culprits, but the same EMFs exist in gradually decreasing levels all along the grid, from substations to transformers to homes. Researchers found that children living within 650 feet of power lines had a 70% greater risk for leukemia than children living 2,000 feet away or more. (As per British Medical Journal, June, 2005). “Several studies have identified occupational exposure to extremely low-frequency electromagnetic fields (EMF) as a potential risk factor for neuro degenerative disease.”(As per Epidemiology, 2003 Jul; 14(4):413-9). Many researchers are studying the effect of Electrostatic field on animals. In order to do so they keeps the cages of animals under high Electrostatic field of about 30 kV/m. The results of these Experiments are shocking as animals (are kept below high Electrostatic field their body acquires a charge & when they try to drink water, a spark usually jumps from their nose to the grounded Pipe) like hens are unable to pick up grain because of chattering of their beaks which also affects their growth. 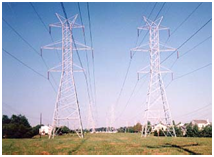 Most of the areas in agricultural and forest lands where high power transmission lines pass. The voltage level of high power transmission Lines are 400KV, 230KV, 110KV, 66KV etc. The electromagnetic field from high power transmission lines affects the growth of plants. Gradually increases or decreases and reaches to maximum current or minimum current and thereafter it starts to fall down to lowest current or raises to maximum current or a constant current. Again the current, it evinces with little fluctuations till the next day morning. Current in Power transmission lines varies according to Load (it depending upon the amount of electricity consumed by the consumers). Hence the effect of EMF (due to current flowing in the power lines) upon the growth of plants under the high power transmission lines remains unaltered throughout the year. From various practically study it was found that the response of the crop to EMF from 110 KV and 230 KV Power lines showed variations among themselves. Based on the results the growth characteristics like shoot length, root length, leaf area, leaf fresh weight, specific leaf weight, shoot/root ratio, total biomass content and total water content of the four crop plants were reduced significantly over the control plants. Similar trend were observed in the biochemical characteristics like chlorophyll. Reduced growth and physiological parameter was primarily due to the effect of reduced cell division and cell enlargement. Further the growth was stunted which may be due to poor action of hormones responsible for cell division and cell enlargement. The bio-chemical changes produced in this plant due to EMF stress quite obvious and it affects the production leading to economic loss. It is concluded that the reduced growth parameter shown in the crop plants would indicates that the EMF has exerted a stress on that plants and this EMF stress was quite obvious and it affects the production leading to economic loss. So further research activities are needed to safe guard plants from EMF stress. When a vehicle is parked under high voltage transmission line an electrostatic field is developed in it. When a person who is grounded touches it a discharge current flows through the human being. In order to avoid this parking lots are located below the transmission lines the recommended clearance is 17 m for 345 kV and 20 m for 400 kV lines. A fence, irrigation pipe, pipeline, electrical distribution line forms a conducting loops when it is grounded at both ends. The earth forms the other portion of the loop. The magnetic field from a transmission line can induce a current to flow in such a loop if it is oriented parallel to the line. If only one end of the fence is grounded, then an induced voltage appears across the open end of the loop. The possibility for a shock exists if a person closes the loop at the open end by contacting both the ground and the conductor. For fences, buried cables, and pipe lines proper care has been taken to prevent them from charging due to Electrostatic field. When using pipelines which are more than 3 km in length & 15 cm in Diameter they must be buried at least 30 laterally from the line center. For providing continuous and uninterrupted supply of electric power to consumers maintenance operations of power lines are often performed with systems energized or live. This is live line maintenance or hot line maintenance. The electric fields and magnetic fields associated with these power lines may affect the health of live line workers. Its electric field and current densities affect the health of humans and cause several diseases by affecting majority parts of the human body. These electric field and current densities affects humans of all stages and causes short term diseases in them and sometimes death also. There are two reasons why electromagnetic fields associated with power systems could pose no threat to human health. First, The EMF from power lines and appliances are of extremely low frequency and low energy. They are non-ionizing and are markedly different in frequency from ionizing radiation such as X-rays and gamma rays. As a comparison, transmission lines have a low frequency of 60Hz while television transmitters have higher frequencies in the 55 to 890 MHZ range. Microwaves have even higher frequencies, 1,000 MHZ and above. Ionizing radiation, such as X-rays and gamma rays, has frequencies above 1015 Hz. The energy from higher-frequency fields is absorbed more readily by biological material. Microwaves can be absorbed by water in body tissues and cause heating which can be harmful, depending upon the degree of heating that occurs. X-rays have so much energy that they can ionize (form charged particles) and break up molecules of genetic material (DNA) and no genetic material, leading to cell death or mutation. In contrast, extremely low frequency EMF does not have enough energy to heat body tissues or cause ionization. Second, all cells in the body maintain large natural electric fields across their outer membranes. These naturally occurring fields are at least 100 times more intense than those that can be induced by exposure to common power-frequency fields. However, despite the low energy of power-frequency fields and the very small perturbations that they make to the natural fields within the body. When an external agent such as an ELF fields lightly perturbs a process in the cell, other processes may compensate for it so that there is no overall disturbance to the organism. Some perturbations may be within the ranges of disturbances that a system can experience and still function properly. <1 Absence of any established effects. 1 To 10 Minor biological effects. >1000 Ventricular Fibrillation (Heart Condition 0. Health hazards. In India it is stipulated that electric field intensity should not exceed 4.16 kV/m and magnetic field intensity should not exceed 100μT in public areas. Even when effect is demonstrated consistently on the cellular level in laboratory experiments, it is hard to predict whether and how they will affect the whole organism. Processes at the individual cell level are integrated through complex mechanisms in the animal. There are two basic 60-Hz magnetic field mitigation (reduction) methods: passive and active. Passive magnetic field mitigation includes rigid magnetic shielding with ferromagnetic and highly conductive materials, and the use of passive shield wires installed near transmission lines that generate opposing cancellation fields from electromagnetic induction. Active magnetic field mitigation uses electronic feedback to sense a varying 60-Hz magnetic field, then generates a proportionally opposing (nulling) cancellation field within a defined area (room or building) surrounded by cancellation coils. Ideally, when the two opposing 180-degree out- of-phase magnetic fields of equal magnitude intersect, the resultant magnetic field is completely cancelled (nullified). This technology has been successfully applied in both residential and commercial environments to mitigate magnetic fields from overhead transmission and distribution lines, and underground residential distribution (URD) lines. Line compaction means that, bringing the conductors close together keeping the minimum (safe) phase-to-phase spacing constant. Keeping all the parameters the same and the only variable is the phase-to- phase spacing. The magnetic field is proportional to the dimensions of the phase-to-phase spacing. Other studies showed that, increasing the distance between phases by increasing the height of the central phase conductor above the level of the other phase conductors leads to the reduction of the peak value of the magnetic field. Reducing the phase-to-phase distance, leads to the decrease of the magnetic field. This reduction between phases is limited by the electrical insulation level between phases. (A) For single circuit lines, compaction causes a great reduction to the maximum magnetic field values. This reduction of magnetic field allows for lower conductor heights above the ground. This leads to transmit the same power on shorter towers. This gives a great reduction of the tower cost. Induced currents are always present in electric fields under transmission lines and will be present. However, there must be a policy to ground metal objects, such as fences, that are located on the right-of-way. The grounding eliminates these objects as sources of induced current and voltage shocks. Multiple grounding points are used to provide redundant paths for induced current flow and mitigate nuisance shocks. Overhead transmission systems required strips of land to be designed as right-of-ways (R.O.W.). These strips of land are usually evaluated to decrease the effects of the energized line including magnetic and electric field effects. Unlike fences or buildings, mobile objects such as vehicles and farm machinery cannot be grounded permanently. Limiting the possibility of induced currents from such objects to persons is accomplished by maintaining proper clearances for above-ground conductors tend to limit field strengths to levels that do not represent a hazard or nuisance. Limiting access area by increasing conductor clearances in areas where large vehicles could be present. Based on the review and analysis and other research projects it is of the opinion that there is no conclusive and convincing evidence that exposure to extremely low frequency EMF emanated from nearby high voltage Transmission lines is causally associated with an increased incidence of cancer or other detrimental health effects in humans. Even if it is assumed that there is an increased risk of cancer as implied in some epidemiological studies, the empirical relative risk appears to be fairly small in magnitude and the observed association appears to be tenuous. Although the possibility is still remain about the verse effect on health by EMF. Pharmacology, School of Medicine, Chung-Ang University, Seoul, Korea-Sung-Hyuk Yim, Ji-Hoon Jeong. Electrical Engineering Department, Shoubra, Benha University, Cairo, Egypt- Nagat Mohamed Kamel Abdel-Gawad. Electrical Engineering Department at King Fahd University of Petroleum & Minerals- J. M. Bakhashwain, M. H. Shwehdi, U. M. Johar and A. A. AL-Naim. Dept. of Electrical Engineering. College of Engineering – University of Tikrit-Iraq- Ghanim Thiab Hasan, Kamil Jadu Ali, Mahmood Ali Ahmed. A House hold power saving devices has recently received a lot of attention from both consumers and manufacturers. It is generally used in residential homes to save energy and to reduce electricity bills. It is a small device which is to be plugged in any of the AC sockets in the house (Mostly near Energy Meter). Moreover, some of the companies claim that their power savers save up to 40% of the energy. Many people believe that the claims made by the power saver manufacturing companies are false. Almost all people who buy power savers do it to reduce their electricity bills. Many people who have used these power savers said that they could reduce their electricity bills with the devices; however the reduction was not as much as they had expected. Moreover, they could not figure out if the reduction in electricity bills was due to the power savers or because of their efforts to reduce their electrical usage. There have been several serious discussions about the genuineness of the device. In This Note, We will try to find the real truth behind these power savers which claim to save as much as 40% of energy. A Power Saver is a device which plugs in to power socket. Apparently just by keeping the device connected it will immediately reduce your power consumption. Typical claims are savings between 25% and 40%. It is known that the electricity that comes to our homes is not stable in nature. There are many fluctuations, raise and falls, and surges/Spikes in this current. This unstable current cannot be used by any of the household appliances. Moreover, the fluctuating current wastes the electric current from the circuit by converting electrical energy into heat energy. This heat energy not only gets wasted to the atmosphere, but also harms the appliances and wiring circuit. Power Saver stores the electricity inside of it using a system of capacitorsand they release it in a smoother way to normal without the spikes. The systems also automatically remove carbon from the circuit which also encourages a smoother electrical flow. This means that we will have less power spikes. More of the electricity flowing around circuit can be used to power appliances than before. Basically it is claimed that Power savers work on the principle of surge protection technology. Power savers work on straightening this unstable electric current to provide a smooth and constant output. The fluctuation in voltage is unpredictable and cannot be controlled. However, the power savers utilize current fluctuation to provide a usable power by acting like a filter and allowing only smooth current to pass through the circuit. Power savers use capacitors for this purpose. When there is a surge of current in the circuit, the capacitor of the power saver stores the excess current and releases it when there is a sudden drop. Thus only smooth output current comes out of the device. Moreover, a power saver also removes any type of carbon in the system, which facilitates further smoother flow. The main advantage of power savers is not that they provide a backup system in times of low current, but that it protects the household appliances. It is known that a sudden rise in the power can destroy the electrical appliance. Thus, the power saver not only protects the appliance but also increases its life. Moreover, they also reduce the energy consumption and thus the electricity bills. The amount of power saved by a power saver depends on the number of appliances on the circuit. Also, the system takes at least a week to adapt itself fully to the circuit, before it starts showing its peak performance. The maximum amount of voltage savings will be seen in areas where in the current fluctuation is the highest. Power Factor Correction for residential customers (home owners) is a scam? At most, each unit is worth as an investment. 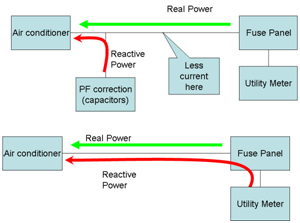 Power factor correction does make sense for some commercial / industrial customers. Many Companies promoting and advertise that their Power Saver unit are able to save domestic residential power consumption by employing an “active power factor correction” method on the supply line. The concept seems pretty impressive as the concept is true and legally accepted. But practically, we will find that it’s not feasible. To support above statement First we need to understand three terms. Basic Power Terminology (KW, KVA, KVAR). Electrical Tariff method of Electricity Company for Household Consumer and Industrial Consumer. There are basically two kinds of load that exists in every house: one that is resistive like incandescent lamps, heaters etc. and the other that’s capacitive or inductive like ACs, refrigerators, computers, etc. The power factor of a Resistive Load like toaster or ordinary incandescent light bulb is 1 (one). Devices with coils or capacitors (like pumps, fans and florescent light bulb ballasts)-Reactive Load have power factors less than one. When the power factor is less than 1, the current and voltage are out of phase. This is due to energy being stored and released into inductors (motor coil) or capacitors on every AC cycle (usually 50 or 60 times per second). There are three terms need to be understand when dealing with alternating (AC) power. First Term is kilowatt (kW) and it represents Real power. Real power can perform work. Utility meters on the side of House measure this quantity (Real Power) and Power Company charge for it. The second term is reactive power, measured in KVAR. Unlike kW, it cannot perform work. Residential customers do not pay for KVAR, and utility meters on houses do not record it too. The third term is apparent power, referred to as KVA. By use of multi meters we can measure current and voltage and then multiply the readings together we get apparent power in VA. Therefore, Real Power (Watts) = Apparent Power × PF = Voltage × Ampere × PF. Ideally a PF = 1, or unity, for an appliance defines a clean and a desired power consumption mostly Household Equipments (The dissipated output power becomes equal to the applied input power). In the above formula we can see that if PF is less than 1, the amperes (current consumption) of the appliances increase, and vice verse. With AC Resistive Load, the voltage is always in phase with the current and constitutes an ideal power factor equal to 1. However, with inductive or capacitive loads, the current waveform lags behind the voltage waveform and is not in tandem. This happens due to the inherent properties of these devices to store and release energy with the changing AC waveform, and this causes an overall distorted wave form, lowering the net PF of the appliance. Manufacture claim that the above problem may be solved by installing a well-calculated inductor/capacitor network and switching it automatically and appropriately to correct these fluctuations. A power saver unit is designed exactly for this purpose. This correction is able to bring the level of PF very close to unity, thus improving the apparent power to a great extent. An improved apparent power would mean less CURRENT consumption by all the domestic appliances. So far everything looks fine, but what’s the use of the above correction? The Utility Bill Which We pay is never based on Apparent Power (KVA) but it is based on Real Power (KW). The utility bill that we pay is never for the Apparent Power- it’s for the Real Power. By Reducing Current Consumption Does Not Reduce Power Bills of Household Consumer. Let us try to study Household’s Reactive-Resistive Electrical Load and Voltage Spike Characteristic by example. In the second expression we clearly show that a reduction in current consumption by the refrigerator, but interestingly in both the above cases, the Real Power remains the same, i.e. the refrigerator continues to consume 100 watts, and therefore the utility bill remains the same. This simply proves that although the PF correction done by an energy saver may decrease the Amperage of the appliances, it can never bring down their power consumption and the electric Bill amount. Reactive power is not a problem for a Reactive Load of Home appliances like A.C, Freeze, motor for its operation. It is a problem for the electric utility company when they charge for KW only. If two customers both use the same amount of real energy but one has a power factor of 0.5, then that customer also draws double the current. This increased current requires the Power Company to use larger transformers, wiring and related equipment. To recover these costs Power Company charged a Penalty to industrial customers for their Low power factors and give them benefits if they improve their Power Factor in. Residential customers (homes) are never charged extra for their reactive Power. Since a resistive load does not carry a PF so there is not any issue regarding filtering of Voltage and Current, So Power = Voltage X Current. In above discussion simply proves that as long as the voltage and the current are constant, the consumed power will also be constant. However, if there’s any rise in the input voltage because of a fluctuation, then as explained above your appliances will be forced to consume a proportionate amount of power. This becomes more apparent because current, being a function of voltage, also rises proportionately. However, this rise in the power consumption will be negligibly small; the following simple math will prove this. Consider a bulb consuming 100 watts of power at 220 volts. This simply means at 240 volts it will use up about 109 watts of power. The rise is just of around 9% and since such fluctuations are pretty seldom, this value may be furthermore reduced to less than 1%, and that is negligible. Thus the above discussions convincingly prove that energy savers can never work and the concept is not practically feasible. What happens when Power Saver is installed? The Fig shows the result of using Power Saver. The air conditioner (which has a large compressor motor) is still consuming reactive power but it is being supplied by a nearby capacitor (which is what is in those “KVAR” boxes). If you were to mount it at the air conditioner and switch it on with the air conditioner plus you sized the capacitor perfectly, then there would be no reactive power on the line going back to the fuse panel. If the wire between your fuse panels is very long and undersized, reducing the current would result in it running cooler and having a higher voltage at the air conditioner. These savings due to cooler wiring is minimal. A further complication is that if you install the “KVAR” unit at the fuse panel, it does nothing for the heat losses except for the two feet of huge wire between the fuse panel and the utility meter. Many KVAR units are marketed as boxes that you install at a single location. If your power factor box is too large, then it will be providing reactive power for something else, perhaps your neighbor. Power factor correction devices improve power quality but do not generally improve energy efficiency (meaning they would not reduce your energy bill). There are several reasons why their energy efficiency claims could be exaggerated. First, residential customers are not charged for KVA- hour usage, but by kilowatt-hour usage. This means that any savings in energy demand will not directly result in lowering a residential user’s utility bill. Second, the only potential for real power savings would occur if the product were only put near in the circuit while a reactive load (such as a motor) were running, and taken out of the circuit when the motor is not running. This is impractical, given that there are several motors in a typical home that can come on at any time (refrigerator, air conditioner, HVAC blower, vacuum cleaner, etc. ), but the Power Saver itself is intended for permanent, unattended connection near the house breaker panel. And certainly not in the way the manufacturers recommend that they be installed, that is, permanently connecting them at the main panel. Doing that drags the power factor capacitive when the inductive motors are off and could create some real problems with ringing voltages. The KVAR needs to be sized perfectly to balance the inductive loads. Since our motors cycle on and off and we don’t use the air conditioner in the winter, there is no way to get it sized properly unless we have something to monitor the line and switch it on and off capacity (capacitors) as necessary. Adding a capacitor can increase the line voltage to dangerous levels because it interacts with the incoming power transmission lines. Adding a capacitor to a line that has harmonic frequencies (created by some electronic equipment) on it can result in unwanted resonance and high currents. For commercial facilities, power factor correction will rarely be cost-effective based on energy savings alone. The bulk of cost savings power factor correction can offer is in the form of avoided utility charges for low power factor. Energy savings are usually below 1% and always below 3% of load, the higher percentage occurring where motors are a large fraction of the overall load of a facility. Energy savings alone do not make an installation cost effective.